Prayers for Gunagrahi Goswami's Health ~ The Toronto Hare Krishna Temple! 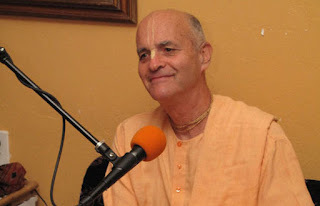 It is with heavy hearts that we inform our Toronto Hare Krishna community that Gunagrahi Goswami, a very senior member of our international Hare Krishna movement, has been diagnosed with cancer. Based out of South America (Argentina), Gunagrahi Goswami has visited Toronto a few times in recent years, capturing the hearts of our local devotee community with his inspiring classes, exotic musical instruments, kirtans and more. Unfortunately, a recent PET scan revealed that the cancer has spread to his lungs and inside the lymph nodes of the pelvis, which means this is stage-4 cancer. Urgent funds are needed to treat this extremely serious, life-threatening condition and GoFundMe page has been setup to collect donations from devotees around the world. Donations are quickly pouring in from around the globe. Of course, we are asking our devotee community to pray for Maharaj's health. Gunagrahi Goswami made several visits to Toronto and below are some video highlights of his visits from a few years ago. Please kindly keep him in your prayers.